Superman: Unlocks automatically from the main story in Level 13 - "They Think It's Owl Over." You may be able to use Superman (Movie) from the DC Movie Character Pack. For this achievement you will have to beat the main story of the pack first, then come back in Free Play and hold to find Superman from the character chart, select him. You can even use Justice League Superman. The pig in this level is right in the beginning of the level you may have to wait until the second section to try this. Have Superman jump on the pig's back with and move it around. Visuals at (0:05) for this achievement. This video is for Minikits as well. Now the aim of this achievement is to ride the pig which is situated to back of the big top tent which you spawn in. First of all you will need to fight with Sivana until you have to button bash , and he flys off. 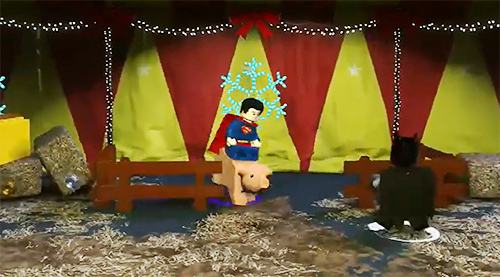 Now as your choice of Superman go upto the pig and you will be now prompted to press , so that you can jump on its back and ride it. As soon as you press the and mount the pig, pop achievement unlocked.